I am stuck creatively, so I’m writing in my blog. The one thing it does do is keep me from listening to ghazals or watching bharat natayam videos on YouTube or any of a number of things that are not actually constructive exercises in removing creative blocks. If somebody figures out what a constructive exercise as pertains to this looks like, please share. I have been making thumbnails. I have been reading. I went outside and drew little tiny pictures of web pages for an hour. I made diagrams. I labeled the diagrams. And so then I remembered this blog, and how sometimes it helps to just regurgitate the random stuff in my head. Here’s hoping I’m not wrong. This is fairly normal for me. My mom and dad are culture nuts, and they were very open and accepting of different beliefs, cultures, people, etc. My mother worked for the Minority Affairs office at the University of Kansas before I was born, and has wonderful stories of the people she knew through that job – the Potawatamie Indian with whom she went to pow-wows; the man from Gabon; the dances and dinners she attended. We have portraits of great Native American chiefs in our den. We listened to world music. We ate all kinds of non-American foods. My mother, previously a devout and strict Catholic, became a student of spirituality after leaving the MaryKnoll order (the Catholic missionary order, of which she was a novice for 6 months) and because of this I am a firm believer in reincarnation and karma and dharma, even if those things were never described to me in that way (she’s now an Episcopalian, and I realize I just outed her weird). I usually don’t mention this in the same conversation as what it means to me to be Episcopalian, because these things are not exactly the same. When I started to think about where this obsession with India came from, I started to remember these things about my childhood, primarily the fact that I went to a Montessori school with the Patel sisters and Shyamal Brambhatt (I don’t recall if this is the exact spelling; I was four when I knew him) and Matthew Pannikar and, most notably Jaydeep Desai. My parents were friends with Jaydeep’s parents. They owned a small motel in town (as many Gujarati immigrants do) and we were at their house fairly regularly from the time I was four until they moved away when I was 13 or so. We visited them in Texas (Houston, I think) a couple of times in my teenage years, but they were a big part of my more formative childhood years. I remember the fiery chutney Mrs. Desai made, and how their house smelled, and the Ganesh on their home mandir, under the bindi-ed portraits of Mr. and Mrs. Desai’s grandparents, and the box of assorted mukhwas that I totally upended onto the carpet in their living room. I really remember Jaydeep’s Nintendo system. We didn’t have a Nintendo. This made him Very Cool. In the 7th grade, Mrs. Desai dressed me in a sari for our Geography lesson on India. I wore the bangles and the bindi and the jewelry and I felt like a princess for 45 minutes. And then I sort of forgot about these things during high school. In the 12th grade, I took a sort of spiritual journey, and also classes on Paganism (more specifically Wicca). I practiced that for about 6 months before I decided that it wasn’t really speaking to me, and came back to the Episcopal church. Now it’s sort of 10 years after that, but this is a bit different. I think the things that didn’t connect me to the Pagan path are things that are drawing me to India and Hinduism. Modern pagans are creating their own history and culture, something that is a little too close to the American experience for me (which, for some unknown and inexplicable reason, is not something I relate to easily); India is an ancient place with a rich history and tradition, and Hinduism is a big part of that. I don’t know where this puts the Episcopal church and that tradition. That has been in my family for generations, and it’s still very important. It still may be. I don’t know that yet. If I’m honest with myself, there’s a chance that I will go through this with an even stranger set of mismatched beliefs, but I feel that each journey is part of the path to God, and I am not the one to say that one is more valuable than the other. My own journey is the one that is right for me. This entry was posted in General stuff, india and tagged christianity, hinduism, journey, spirituality. Bookmark the permalink. 6 Responses to I’m a special kind of nut. My husband and I have had many a discussion on how our religious beliefs are so very different from what mainstream Americans can understand. There are so many things out there that the “traditional” Christian church just can not explain, or wont. Like how my husband knows when I have a migraine from 100 miles away before I have said a word about it to anyone. I was often given grief growing up because my family thought it was evil that I wanted to learn about other religious beliefs. I never told them that I was trying to fill in some of the holes that I felt were still there… I never have to this day. Sadly my parents are to close-minded to understand. Like you I have long been fascinated with the culture of India. Mine came from the family down the street. I don’t remember their last name off the top of my head but I was friends with their son Roger when nobody else would be. Roger was extremely autistic in a time when people didn’t know what that meant at all. His mother was sweet and brought me beautiful roses from their garden every time she asked me to come over and get Roger off his Nintendo. I was one of the few who could without tears. Their home always smelled fantastic and she was pleasantly surprised when she handed me a plate of fragrant rice and chicken curry and I ate it hungrily and without pulling a face! I hadn’t thought about Roger and his family in a while… Thank you for stirring up that memory. And thank you for beautifully voicing a thought I had long had and didn’t know how to voice on my own! I have this wonderful vision of a time when we can all be civil and grown-up about conversations on religion, or even forget about the differences in religion, because we realize that the religion isn’t the important thing – it’s what you do with it. At their cores, each major religion basically tells you to do good things for other people, and be happy with what you’ve got. Ultimately, there’s beauty to be seen in conflict, though, and part of life is learning from that. I’m sad that you haven’t had a supportive environment on your search, but I hope that you come out of it as a stronger person because of the extra effort. Hang in there. On the upside, there’s an awesome community out there who is going through the exact same thing, so know you’re not alone! I’m glad I could help make some sense of things! Thanks for reading! I’m the same way about finding a path with some history behind it. I don’t want to reinvent the wheel, as the saying goes. There are religions out there, like Hinduism, that have the traditions and philosophies already there! It makes more sense to me to follow that than what my parents do, which is extract the philosophy part and attach it to modern American life. 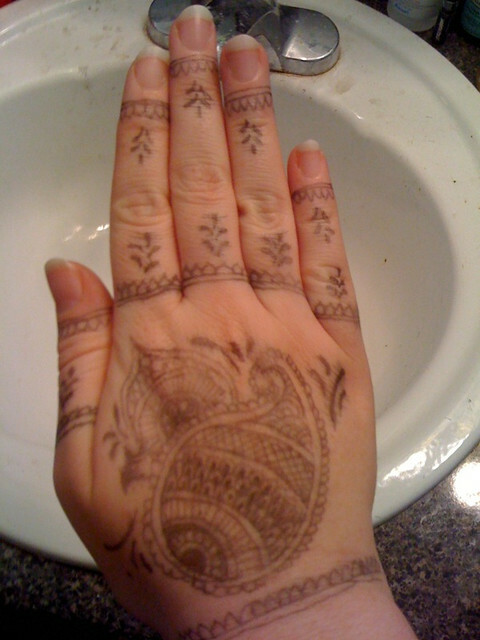 I love your pen-mendhi, by the way. It looks beautiful. Totally! It feels a little more real somehow (which is not to sat that Wicca isn’t real to those who practice it). I met a man at the dining hall at the temple yesterday and had a conversation about the temple and the church I grew up in, and how there are similarities between the two, mostly because there’s a history there. Hello. I was scrolling down the WordPress readomatic feature and the title of your post caught my attention. One statement that you made I agree with. Blogging can be a great place to organize thoughts; like thinking out loud and being able to go back and review. It sounds like you have passed through a lot of seasons from a spiritual perrspective. As a youth, I was in serius danger of heading down the path of paganism. It’s a miracle that I didn’t because as my thoughts began to flow in that direction, there was a “supernatural luring” that could be felt. There are entites which will portray themselves as benign but are the agents of deception. I had a friend who didn’t make it out of such a place. The single element that kept me standing in the door and looking in, but not entering, was a fear of God. Despite the incredible confusion of those days, the fear of God kept me from proceeding any further. shortly afgter high school I met the Savior in a way that forever changed my life. One thing that I did do during those crazy years is pray. I would ask God (whom I knew existed) please show me what is true and what is not, because there’s so much confusion out here. He honored that sincere request. Well so much for rambling on the site of a complete stranger. Please feel free to delete this if it’s over the top. One thing that makes this forum interesting is that we never know who will pass by. I enjoyed reading this post. Thanks. Thanks for being honest and for taking the step of sharing this conversation! Special thanks for being very open and civil about it, too. So much of what you see on the internet, especially the comment-based conversations on blogs misses that, and it’s nice to see somebody making the effort. I think that my openness comes from the particular branch of Christianity that I was raised with; Episcopalians are by and large a questioning, thinking group. We’re used to thinking and asking questions about our faith (not all of us, but many more than aren’t). I have lots of friends who are self-identified pagans, and they’re all wonderful, caring, generous, kind, good people. They work in their communities. They care for the needy. They help their neighbors. Some of them are more Christian than some Christians I’ve met. I don’t fear Paganism; it just didn’t speak to my soul in a way that I felt was worth pursuing. I came back to the Episcopal church because it made sense to me. I respect God and what I believe to be the truth of the church, and that’s why I came back. However, I am always searching for truth and enlightenment, and that’s what has led me to other philosophies. Now, after saying all that, I am happy that you’ve found something that speaks to your own soul. That’s my hope for everybody – Buddhist, Muslim, Atheist, Pagan, Christian, Hindu, Pastafarian – that we all find Truth in our lives.